This is a fairly small and light vehicle... the PKT looks quite big in comparison. I think the area between the upper and lower set of rockets looks rather large and probably contains servo arms to manually depress the launch buttons on those rocket launchers. This would mean standard run of the mill launchers could be attached. In such a case I would probably have mounted two more on the end and had 6 ready to launch 72mm rockets. 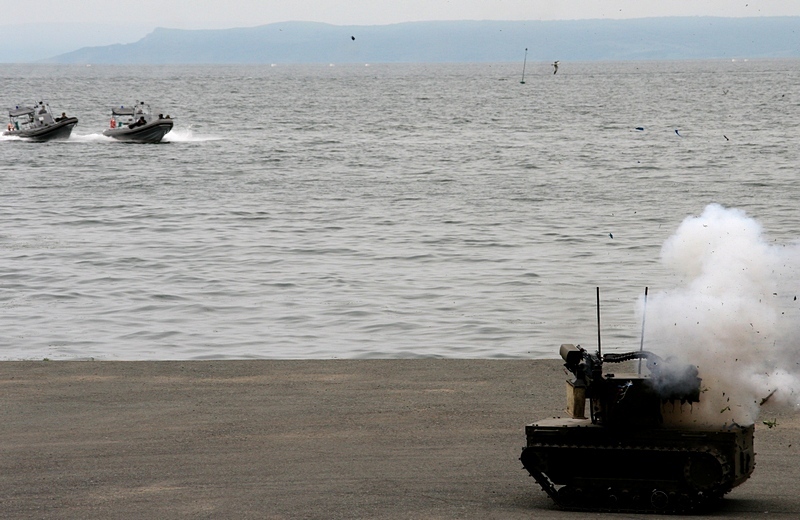 If that is the case then I would go for the RShG-2 assault rocket launcher as its 72.5mmrocket would not over load the vehicle, but its thermobaric warhead should make short work of non armoured targets. for light armoured targets or light and medium vehicles the RPG-26 can penetrate 440mm of armour which should deal with most non tank targets. 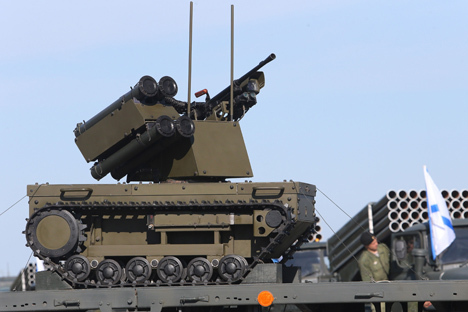 For heavier threats then I would not mount Kornet-EM on an unmanned vehicle... it would be better suited to a Tigr-M with more ready to fire ammo. GarryB wrote: or 4 Kornet-EM's! 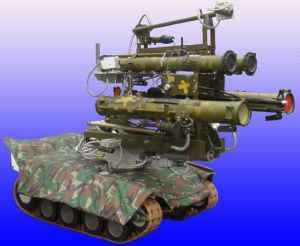 Russian army may soon get a combat robot on the basis of "Tiger" with ATGM "Kornet"
They should also make some of those robots armed with Kornet ATGMs and with Igla-S MANPADs. Considering those robots are small, they could be quite easy to hide and very practical for ambushes or for exposed defense. Protected with robots with machine guns and RPOs against infantry and with recce UAVs to find and track enemies, they could be very deadly in such positions and well reduce exposure of the soldiers. 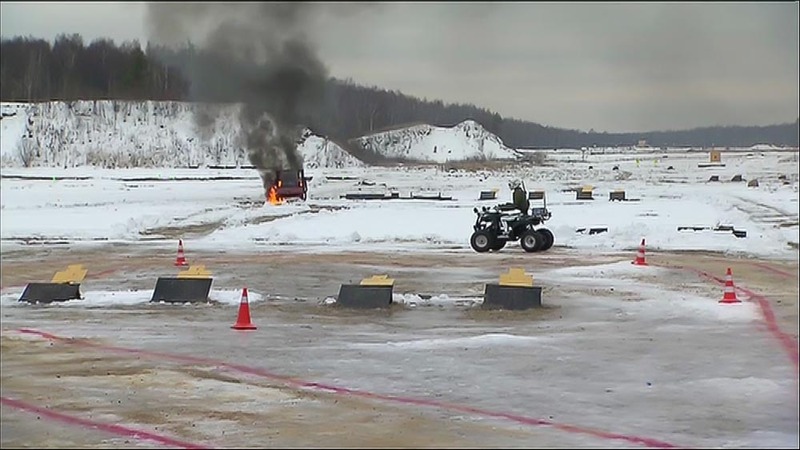 Russia Beyond The Headlines wrote: For the first time, Russia’s armed forces have conducted war games with the participation of new Platform-M combat robots. 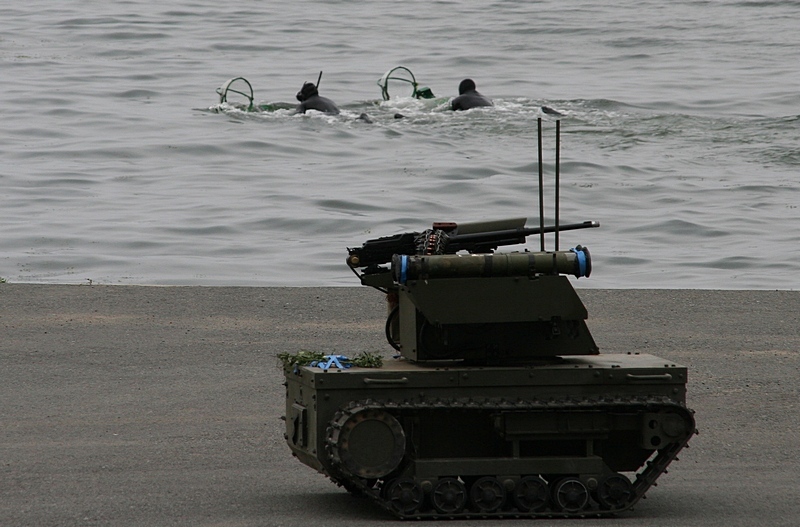 In the course of the exercises by the Baltic Fleet, which took place in mid-June near Kaliningrad, the robotic combat platforms, armed with grenade launchers and Kalashnikov rifles, saw their first action, executing their military missions alongside their live colleagues. The dry runs coincided with the multinational Saber Strike 2014 and Baltops 2014 exercises being carried out by NATO in the same area. ...As you see a rational application of Platform-M is to patrol/guard coastlines on anti-"frogman" duty, and with the proper IR/NV monitor channels you can easily patrol/guard coastline at night on stand by mode without burning gas and the UCGV can be siting idol and being controlled safely from several km's away from a command post on base. There is where the soldiers controlling the vehicle go on 2-4 hour patrol duty where there's 12 men with 12 shifts, or 6 men with 6 shifts respectively, where breaks and getting rest are taken in to consideration which helps break up the monotony of drone patrol duty. 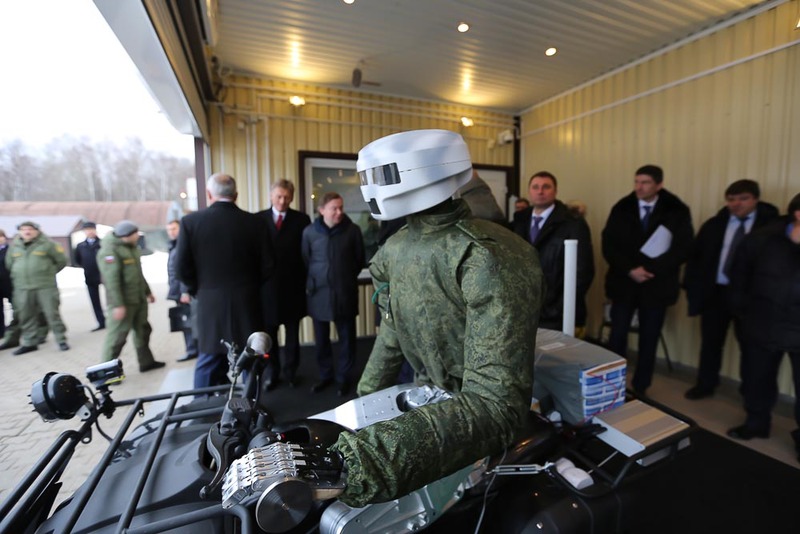 A new robot-avatar, designed to have functions comparable to those of a human being, was revealed to Russian President Vladimir Putin at the Central Institute for Scientific Research Tochmash on Tuesday. 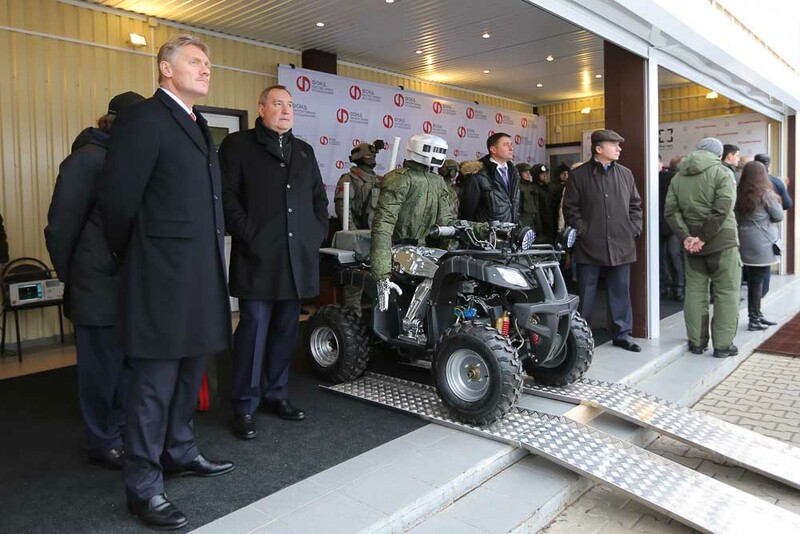 MOSCOW, January 20 (Sputnik) – Russian President Vladimir Putin visited the Central Scientific Research Institute of Precision Engineering Tochmash in the town of Klimovsk, Moscow region on Tuesday, where he was presented to a new robot-avatar that could function similar to a human. 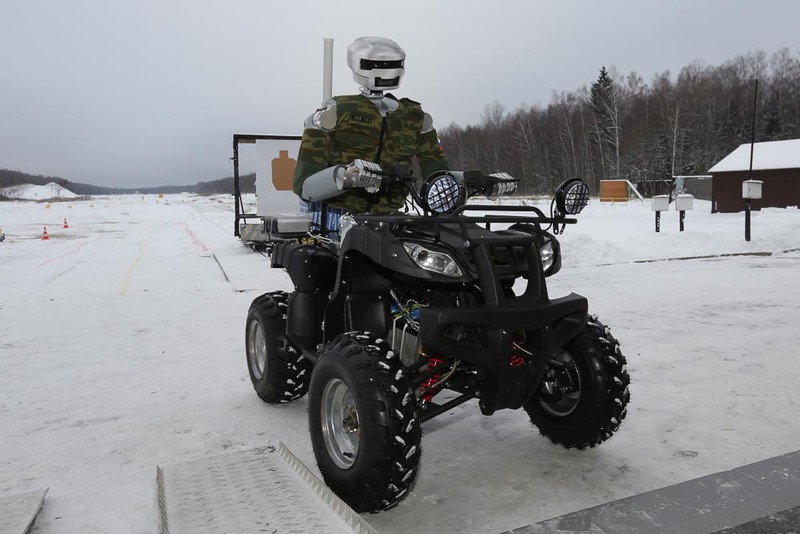 The human-like robot made five shots with its gun and drove a quad around the training area. Special sensors, attached to the robot’s limbs, allow an operator to drive the robot remotely. The combat robot was designed to have functions comparable to those of a human being. The machine is expected to be able to effectively work on its own in the conditions of human infrastructure, travel on a variety of terrains, drive a vehicle and provide emergency medical aid. 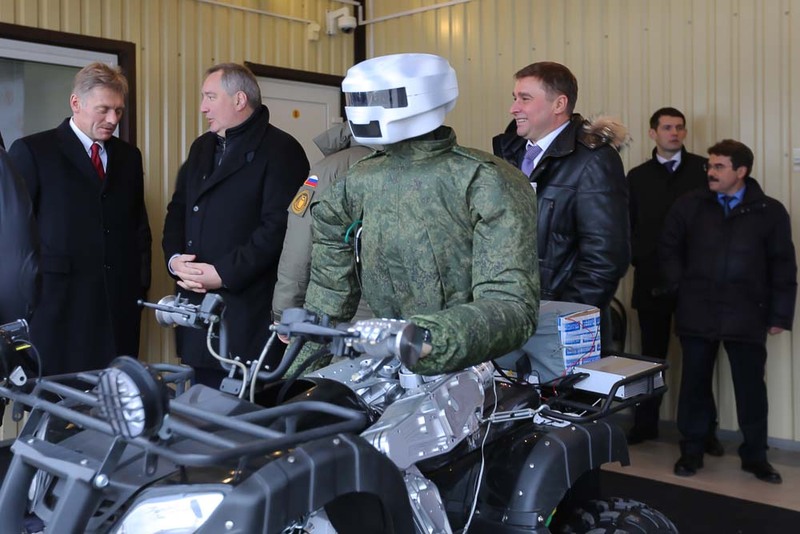 Besides, the new robot, Putin had a chance to examine new protective military equipment that is designed to enhance soldiers’ protection on the battlefield. In addition to the new body armor, new types of guns were also presented to Putin, including a new sniper rifle. Tochmash is Russia’s leading research institute specializing in the development and manufacture of military equipment, ammunition, optical-electronic devices and small arms training simulators. Tochmash institute was established in 1944 and is currently part of the state-owned technologies corporation Rostec. Well the main advantage is that weapons and equipment would not need too much adaptation for this robot to use, plus you could use psychology in its design... when confronted with a human like robot most people will treat it like a human and shoot it in the head or centre of the chest. You could use this as a designer to put nothing of critical importance in those areas so the enemy will waste time shooting at parts that are not really vulnerable to enemy fire. Even anti armour weapons blow a narrow hole through large amounts of armour so a head shot with a Kornet or TOW would likely destroy the head but if it has eyes elsewhere like in the hands or on the shoulders it could continue to function until something critical was hit like the battery or electronics boards. GarryB wrote: Well the main advantage is that weapons and equipment would not need too much adaptation for this robot to use, plus you could use psychology in its design... when confronted with a human like robot most people will treat it like a human and shoot it in the head or centre of the chest. 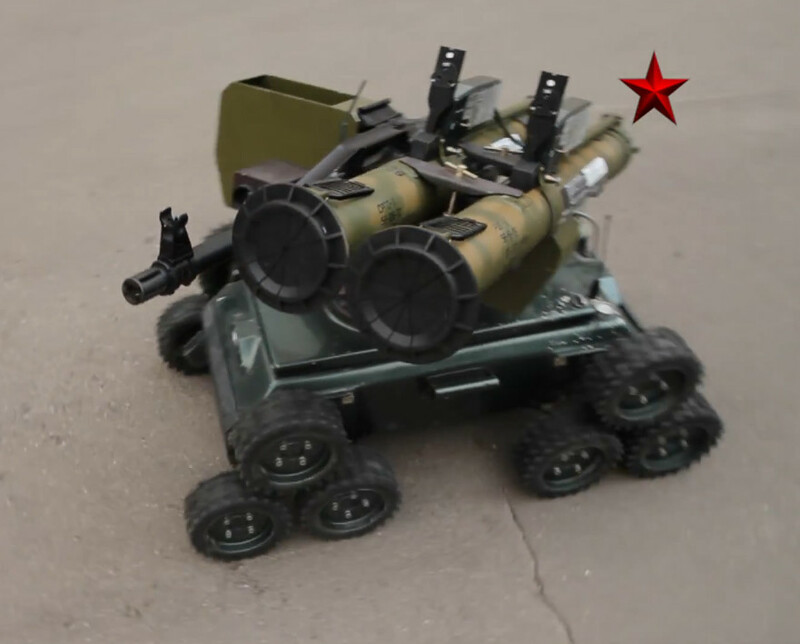 Why not install a module that sets the robot in revenge mode and with red LED eyes and when you shoot at it just says: "You are damaging Government Issue" while reaching at your throat. They pretty much went and ahead and said that this robot will operate autonomously. They mentioned driving vehicles and made it part of their demonstration here too. And they also mentioned emergency medical aid. That actually sounds like a reasonable first use for them. Driving their own medevac vehicles, zipping into areas under fire and evacuating wounded - including those in no-man's land. A conservative role, won't endanger other soldiers or civilians - but at the same time a quite demanding and gruelling one, and not the sort of job that any living human being excels at; it's perfect for robots. The other use that has been hinted at is as a sort of scout; what with the quad-buggie and its autonomy/independence and everything - but UAVs are better for that kind of thing and a lot cheaper. Nice prototype anyway. Over the next 10 years it will no doubt undergo improvements, different materials will be experimented with too, as both attempts to make it more durable, and reduce its cost. There might be a few trials and so on in the coming years; albeit nothing too extensive. It's really on the level of an experiment for now. By the mid 2020s the technology will have reached a stage of maturity whereby series production of the first models can start; for use in medevac duties.. and we'll see where it goes from there. Another factor is that the robot can operate in conditions too hot or too cold or too radioactive for actual humans. looks funny, helmet looks like from daft punk. they shouldve made it(allowed it?) flip the bird to the cameras at least once, that should shut up most bashers. Boring! The controller should have accelerated to a nice fast speed and taken some sharp corners. I wonder what the control lag is like on the arms and hands of this robot. in the article, it was mentioned that the robot had fired a pistol, too bad they didn't show it on video..
That Daft Punk robot was really pathetic. Compare it to Boston Dynamics works. I should be worked on before actually showing it. Net analogov vmire. Ffs. Hope they are not running on air and have proper financing.